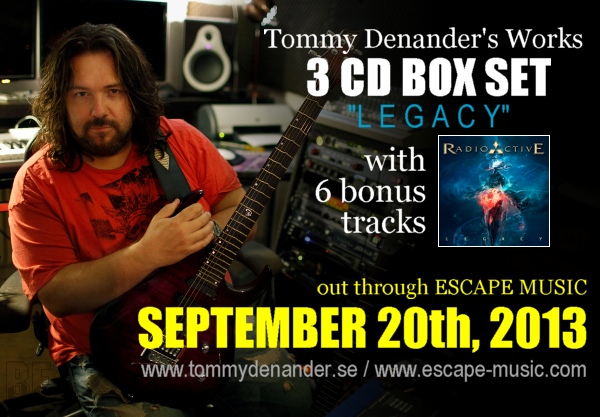 Swedish guitarist Tommy Denander has been working more than 30 years as a pro guitarist, song writer and producer for renown stars. Tommy is ranked as one of the finest guitar players in the world by many today, often featured in the biggest guitar magazines around the world including many cover stories, he was even recently featured in Guitar Player Magazine. His project band RADIOACTIVE has released 3 albums, "Ceremony Of Innocence", "Taken" and "Yeah" so far. This time those albums were re-worked, re-mixed and re-mastered for the box set album "Legacy", which will be released through Escape Music on September 20th, with the Japanese bonus tracks and 3 unreleased tracks.